Offering a wide variety of ideas to spice up training routines, this handbook provides fresh exercises for practicing classical-riding basics. Dressage fundamentals are indispensable for keeping a horse fit and healthy, but forcing them to go through the same movements over and over while working in the arena can lead to boredom. 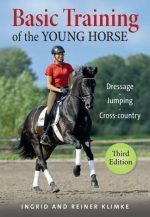 This guide provides upbeat patterns and exercises that take the necessary task of essential schooling and add variety and challenge to everyday workouts, beat the dressage practice blues, and get the job done. Equestrians looking for new tools to add to their training arsenal and those looking to create a supple and gymnasticized horse will delight in this fun collection of practice routines and photographs. Julia Kohl is a German National Federation licensed trainer and instructor.